It was just about this time, last year, that I posted on buying remanufactured ink jet cartridges for our old, but-still-running-well, printer. I bought a 3-pack for about $10 dollars per cartridge. (This post.) We have had a very good experience with these cartridges. They lasted about as long as full-priced ones from Office Depot (currently selling for $53.99 each at OD), and the problems have been minor and may have been the fault of the printer and not the cartridge. The issue we had was an ink smear on a couple of pages, and like I said, this may have been the fault of the very old printer (from c. late 1990s). Otherwise, the remanufactured cartridges worked as well for us as the HP brand. In the comments of that initial post, it was mentioned that HP printers have had a "dynamic security feature" for the last 10 years or so. This "feature" renders no-name brand cartridges ineffective in more recent HP printers. However, older HP printers are some of the most durable printers made, continuing to work for decades (ours is a prime example -- about 20 years old, and going strong). I occasionally see HP printers at thrift stores. So, if someone is needing a printer for basic home use and only wants to spend a few dollars, buying a used HP at Goodwill or the like could be very affordable, especially when combined with remanufactured ink cartridges. It would be advantageous to check HP's website for info on a model sold second-hand, to see if that model had the "dynamic security feature." Here's a link to HP's site which indicates the models with the feature that prevents the use of remanufactured cartridges. At the bottom of that page, there is information on removing the security feature for printers which are listed. I bring this all us because this week I had to order another batch of cartridges. Amazon was out of the 3-pack, so I bought a 2-pack for $18.74, including tax. That's less than $10 per cartridge. They're due to arrive in a week, so I'll let you know of any issues. 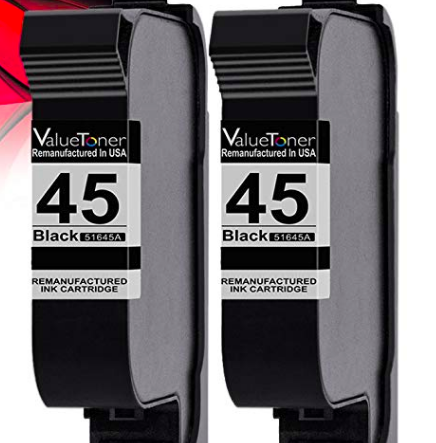 If this batch works as well as the last, then the savings will be over $40 per cartridge. I think that's pretty good. I never thought to look at GoodWill for used printers. We had to purchase a new printer this year (ours gets lots of use). I've had bad experiences with refurbished cartridges in the past, and so I always purchase new cartridges, but our printer was newer than yours. It's great that you've found an inexpensive solution for printer ink cartridges! It seems that, in general, older appliances are more sturdy than newer ones. Our plumber recently told me to hang onto my (old!) clothes washer as long as I can as the newer ones have lots of problems. You know, we bought our Maytag washer and dryer when they were still super well-made. That was 23 years ago and the issues we have had have been super minimal, and repairable by ourselves. They might not look like the newest style, but they work so well that there is no point in up-grading them. I feel the same way about our printer. I wish it could scan as well as print, but seeing as how this was a hand-me-down, and it works so well, we're not about to replace it. Have you found a good source for the name brand cartridges that you use for your printer? I was going to Office Depot because it is handy, but my guess is there are cheaper places to buy the name-brand ones. We now have an HP printer and no, I haven't found a better deal. I haven't had time to do any cost comparisons--we used up the initial cartridges that come with the printer and are just now on our first purchased cartridges. I have an older Epson printer that used to take refurbished cartridges, but now it will only take the original Epson ones. From doing research online, it seems that, during one of the automatic software updates for the printer, some sort of security feature was installed that makes it reject the refurbished cartridges. So frustrating. I had to go buy branded Epson cartridges to get it to work. Oh, that's a real bummer. Like I asked Kris, have you found a cheaper source for the Epson cartridges, at least? Gosh, now I'm definitely not letting go of our printer! Sorry this happened to you. Speaking about older appliance models may be better quality.....I recently bought a 1980s Singer sewing machine from Savers for under $20, after my newish computerized Brother CS6000i locked up and wouldn't sew. I was determined to buy a good old manual type sewing machine, so this find at Savers was a good fortune. The best thing is if it didn't work well, I could have received store credit for an exchange. The plastic tension knob was cracked inside so I removed it and was able to adjust the tension without the knob. I think that's why they donated it. Now I have a reliable sewing machine that won't conk out on me with mysterious error codes. Good deal on the sewing machine! You know, I've wanted a "better" sewing machine for years. The one I have my parents gave to me when I was 21, and it was used and refurbished, then. My machine is all mechanical, made in the 1970s. All of the parts are metal. Things can still go wrong with it, but I can fix it myself -- it is that basic. I still find myself wanting a machine that was shiny and new, and could do lots of neat things. But the one I have seems to work pretty well, so I shouldn't complain. Enjoy your "new" machine! I hope it gives you many years of satisfaction. We inherited my mom's sewing machine from the 1970s. My daughter is the one who enjoys sewing but as she's only 12, I've had to figure out the machine. The manual is hard to follow and there is no good information online, so that's been a challenge, however, I think it was a "better" machine in its day and my seamstress friend told me to hand on to it. YHF, there is a mom in my son's boy scout troop who works at JoAnn Fabrics and is very knowledgeable about sewing. During garage sale season, she purchases old sewing machines, refurbishes them, and then sells them. She is another person who has told me that in the case of sewing machines, old is better than new! That is great that you have this machine for your daughter to use and to learn on. I think your friends are probably right, that you should hang onto this one. It may not be as sophisticated, but you won't run into issues that are difficult to solve, as YHF has found. At least, that is my hope with my old Adler. don't you wish there was a way to edit these posts/comments? There really should be. But I figured out what you meant! I'm showing my age when I used the word "manual" to mean "mechanical", as in manual typewriter...remember those pre-electric dinosaurs? I told my husband he needs to learn sewing machine repair as a hobby, especially since it won't take a computer expert to repair it. That's a good idea, YHF. I think I have the basics figured out and I have a friend who has come over a couple of times to help me trouble-shoot it--since I learn best by doing, that works out well for me.